It's currently 9p.m. on Sunday night as I type this up. I'm exhausted, in the best way possible, from the weekend's activities, and I can't wait to crawl into bed. Friday started out with Sully sleeping in till 8:30am! I actually woke up with a start at 7:45, convinced I had slept through him calling (or crying) for me through the baby monitor. It's rare he sleeps past seven most days, so this was bizarre. As much as I wanted to crawl back into bed, we had plans to meet Nicole and her kiddos at Flip Factory at 9:30, so I got up, showered, did my hair and got all ready before Sully finally woke up. Of course, we were late for our play date, but there was no way I was waking him up early. 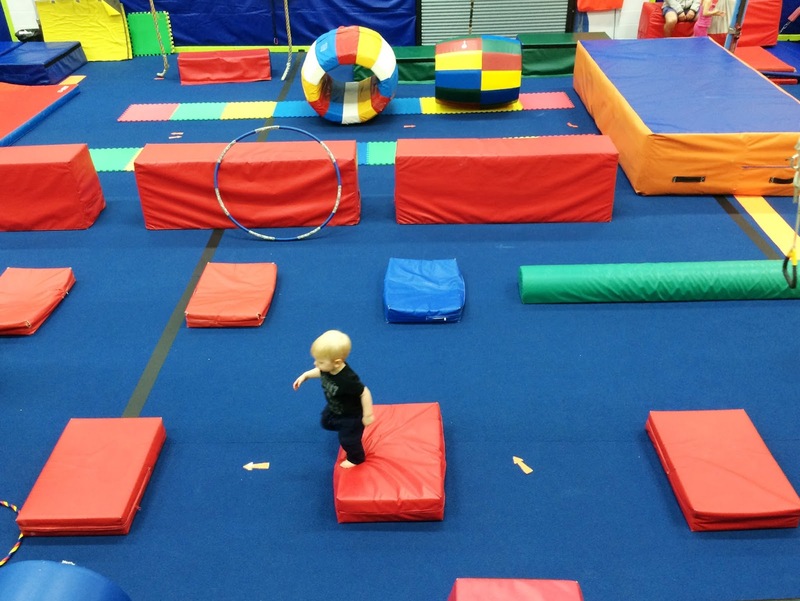 Flip Factory was awesome! 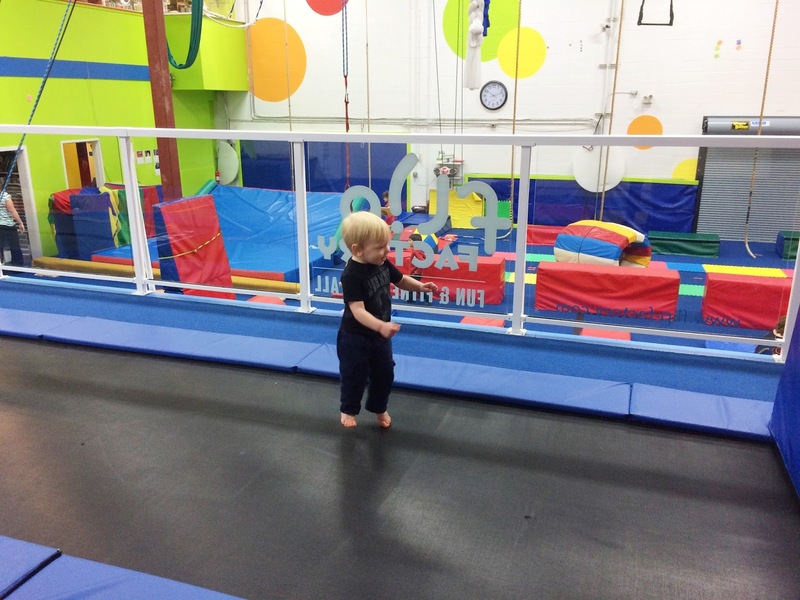 We had never been there before, but Sully loves his weekly gymnastics class, so he felt right at home there. It wasn't very busy either, so it was nice that the kids could really run around and do whatever they wanted. The few pictures I actually managed to take make it look like we were the only ones there (we were not!). The rest of the day was spent taking naps (sadly, not mine), cleaning up around the house, and a few loads of laundry. Then once we picked Jim up from the train station after work, I booked it over to GoodLife Fitness for their Friday evening BodyPump class. Late that evening, my best friend Karen, and her three kids arrived to spend the weekend with us! She hadn't seen our new house yet, and it wasn't until she got here, that we realized we actually hadn't seen each other since September of last year! So a visit was definitely over due! We didn't chat much Friday night, choosing to get a good nights sleep instead. Saturday, the kids were all up around 8a.m. and after breakfast, we got them all dressed and headed out for a walk around the neighbourhood before checking out one of the playgrounds. Getting four kids aged 5 and under to walk together and at a decent pace, is like trying to herd cats! But it was a beautiful day out, and after naps and lunch, we headed back outside and went to a different playground to let the kids burn off more energy. Jim had plans to go to the local pub that night, so Karen and I knew we wanted to get all the kids to bed as early as possible to maximize our alone time in the evening. It's rare we get to talk without kids around, so we spent several hours drinking wine, and then beer, once the wine ran out! We stayed up WAY too late, but I like to think it was worth it. Next time we said we will leave all the kids at home with their dads, and we will just go stay in a hotel room somewhere, haha! That's the new mom dream. Sunday morning was quiet and lazy, and shortly after breakfast and some attempts at taking a group photo of the kids (an impossible feat! ), Karen and her crew headed home. I was sad to see them go, but am so grateful for their visit. 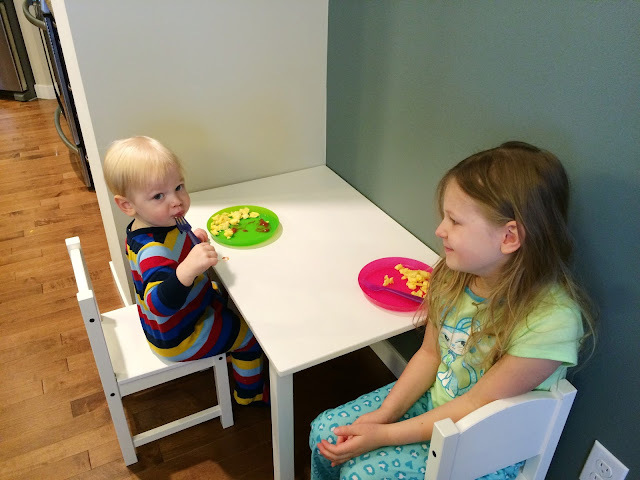 I know how hard it is to pack up one kid for a road trip, so I can only imagine how hard three would be! Karen is a rockstar mom. Thanks for spending the weekend with us! I'd like to say I made good use of the rest of the day, but that would only be true if you count reading, and watching Netflix as a productive afternoon. Oh wait, I did bake an oatmeal casserole for breakfasts this week. And, while there was no way I was going out for groceries today, I do have my meal plan written down for the week and my grocery list ready for tomorrow! Ok, so not all was lost. On the menu this week: (You can also find all these recipes pinned on my Pinterest page). Friday: Sweet Potato "Nachos" with ground chicken and an avocado cilantro cream sauce. How was your weekend? Tell me something fun you did? How old is your oldest friendship? Karen and I have been friends for 12 years! We met our first year of nursing school. And now I feel super old.